A major new survey of recent research relating to the use of religious selection in faith school admissions has failed to identify any evidence supporting the Government’s proposed move to end limits on religious selection by free schools. The report, published by the Fair Admissions Campaign, sets out the full range of evidence, information, and research on religious selection in schools admissions. Drawing on data and analysis from the last 15 years, the study explores the impact that religious discrimination in school admissions has had and continues to have on key issues such as social integration, community cohesion, pupil attainment, parental choice, and equality. A September 2016 analysis of official School Census data revealed that Christian schools that select 100% of their places on the basis of religion are far less diverse than those which select either none or only half of their pupils on the basis of religion. The analysis concludes that if the 50% cap was rolled out to all state schools rather than repealed, ‘tens or even hundreds of thousands of non-white pupils would gain access to their local schools where they haven’t had access before’. Particularly interesting is the attention drawn to the various polls that have been conducted over the last few years, demonstrating that religious selection is hugely unpopular among the population as a whole. Indeed, a poll published by the Accord Coalition in July 2017 found that four out of five people want to keep the 50% cap, including a sizeable majority of every religious group, and other polling suggests around three-quarters want to scrap faith-based admissions entirely. A number of high-profile figures have also condemned the Government’s proposals, including Mayor of London Sadiq Khan, Ofsted Chief Inspector Amanda Spielman, and Conservative ‘Father of the House’ Ken Clarke MP. For further information, please contact the Fair Admissions Campaign on 020 7324 3078 or email info@fairadmissions.org.uk. 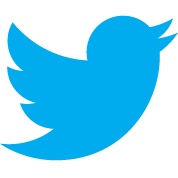 Supporters of the campaign include the Accord Coalition, the Humanists UK, Professor Ted Cantle and the iCoCo Foundation, the Association of Teachers and Lecturers, British Muslims for Secular Democracy, the Campaign for State Education, the Centre for Studies on Inclusive Education, the Christian think tank Ekklesia, the Hindu Academy, the Green Party, the Liberal Democrat Education Association, Liberal Youth, the Local Schools Network, Richmond Inclusive Schools Campaign, the Runnymede Trust, the Socialist Educational Association, and the General Assembly of Unitarian and Free Christian Churches. The use of religious selection in state school admissions significantly reduces the chance of parents being offered their first choice school, new research by the Fair Admissions Campaign (FAC) has revealed. 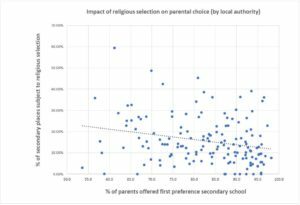 Following the publication of the Government’s official school preference data last week, the FAC compared the proportion of parents in each local authority who were offered their first choice secondary school to the proportion of secondary places in each local authority that are subject to religious selection. 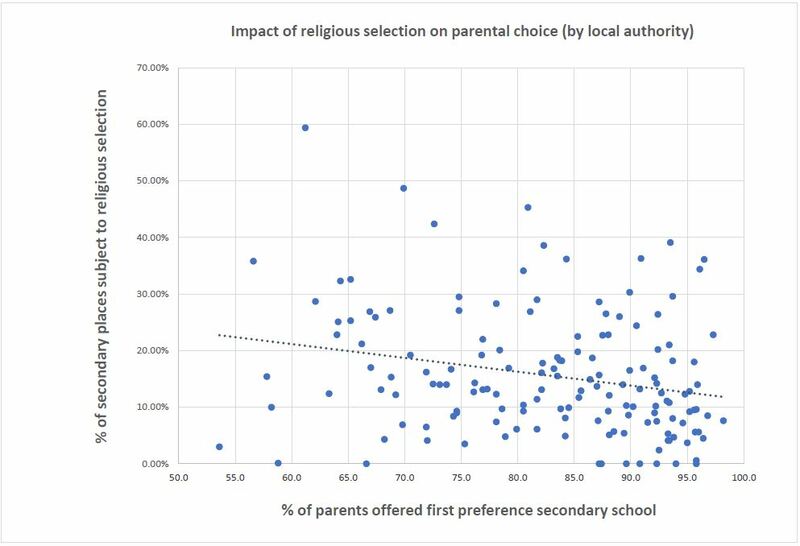 The analysis found that, on average, parents living in local authorities with a high proportion of religiously selective schools were far less likely to be offered their first choice than parents in areas with relatively fewer religiously selective schools. In fact, for every 1% increase in the proportion of secondary school places subject to religious selection, there is a 4.2% increase in parents missing out on their first choice secondary school. The findings reinforce concerns that the Government’s proposal to drop the so-called 50% cap on religious selection and allow new and existing religious free schools to select all of their places on the basis of religion will have a hugely detrimental impact on the education system. Since the proposals were announced by the Prime Minister in September last year, a spate of research has been produced demonstrating that the 50% cap has significantly boosted both integration and social mobility in schools, and that removing it is likely to lead to more ethnically and socially segregated schools. Now that the FAC’s analysis has also revealed that the proposal would reduce the access of local parents to their preferred schools, the Government is likely to face fresh questions as to why it is pursuing a policy so obviously detrimental to parents and children. Fair Admissions Campaign spokesperson Richy Thompson commented, ‘The Government is proposing to lift the cap on religious selection in school admissions in the name of meeting parental demand, but today’s findings demonstrate that precisely the opposite will occur. This research has nothing to say about the pros and cons of faith schools in general, only about whether or not our education system is set up so as to allow for the fair access of local parents to their preferred schools. This is the principle on which our entire school admissions system should be based, but unfortunately the evidence is very clear that religious discrimination detracts significantly both from fair and equal access and from parental choice. The Catholic Education Service (CES) has climbed down on its bid to overturn a decision by the school admissions tribunal, which found that the religious selection test used by Catholic schools is ‘unfair and arbitrary’. The Fair Admissions Campaign (FAC), which along with Humanists UK was responsible in 2015 for revealing that virtually every religiously selective school in England has been breaking the law, welcomed the news. In November last year the Office of the Schools Adjudicator (OSA) ruled that the admission arrangements of a number of Catholic schools in England are unlawful due to their use of the Certificate of Catholic Practice. The Certificate, which was introduced by the CES in 2016, is used to verify whether or not a pupil is from a practising Catholic family, and to subsequently give such pupils priority in admissions. However, the certificate is not subject to any objective test, and simply requires the signature of a priest. The OSA judged this to be too arbitrary a test to comply with the School Admissions Code, which demands that all school admission arrangements be ‘reasonable, clear, objective, and procedurally fair’. Following the OSA’s ruling, the CES together with the Diocese of Westminster were given permission to legally challenge the decision in the High Court. But after discussions with the OSA and the Department for Education, that challenge has now been dropped. This is as the CES has now clarified that, but for ‘exceptional circumstances’, a parent must have attended Mass on Sundays and holydays of obligations for at least five years in order to have their certificate approved by a priest. Despite five years being an extremely long time to have to be religiously practising to gain entry to a school, the OSA has indicated that use of the certificate is now likely to be considered ‘acceptable’ under the School Admissions Code, as this clarification has introduced objectivity into the Certificate’s assessment process.